It was nice this weekend to sleep an extra hour courtesy of the additional hour shoved down our throats by the US Department of Transportation (yes, the US D.O.T. is in charge of standardizing time zones since the Uniform Time Act of 1966). As we transition back into Standard Time, we'd like to take this opportunity to recognize a few cars that are deplorable with a torque convertor equipped slushbox, but delightful with a standard gearbox. First up is the B5 generation Audi A4, a fun affordable luxury sedan with a standard gearbox and a dreadful deathtrap with the slushbox. 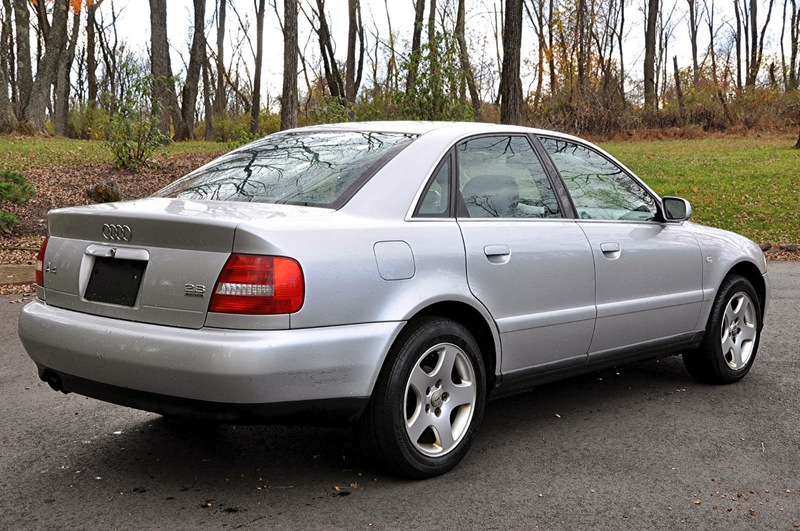 Here is a nice 2001 Audi A4 offered for $5,980 or make-offer on eBay, located in Paterson, NJ with 8 days to go. 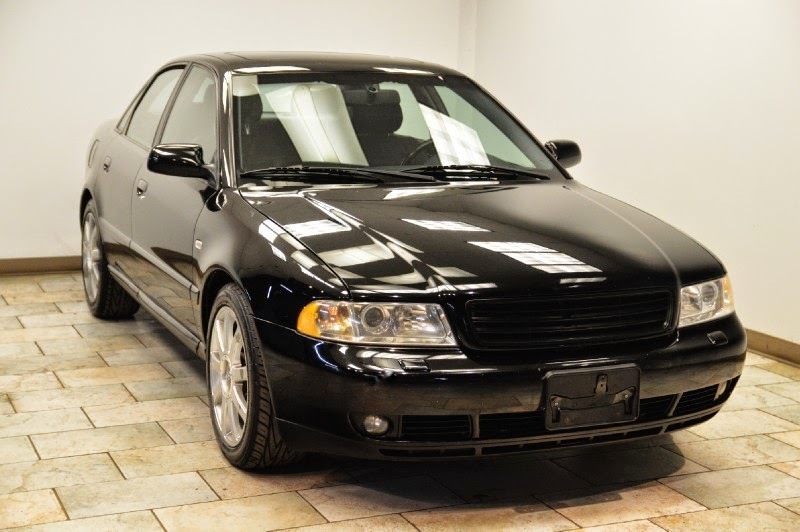 Even with the 5-speed manual gearbox, a 1.8T powered B5 A4 (or B5 Passat, which at the time was essentially a reskinned A4) isn't a fast car by modern standards, but the small K03 turbo in the 1.8T produces a healthy bit of torque (166 ft-lbs) at 1950 rpm. Even the stock 170 horsepower rating feels decent with the 5-speed, but couple the 5-speed tiptronic to the 1.8T and suddenly you'll need your hour back to get where you are going. The biggest problem isn't with medium speed acceleration (the tiptronic does a decent job of changed gears when you ask) but the off-the-line performance is abysmal, particularly if you are crossing a multi-lane street, ease onto the pedal and then change your mind when you see a semi truck barreling down at you. The tiptronic computer locks the torque convertor at very low rpm (1500?) and full throttle in the engine does almost nothing as that semi truck comes closer. Eventually above 2000 rpm the turbo does it stuff and the car starts to move, but if you've ever see a tiptronic 1.8T with a brown stain on the driver's seat, you'll know why. Thankfully, this particular car is free from both brown stains and tiptragic transmissions, only the best 5-speed gearbox (shared with the non-S Porsche Boxster if my memory serves correctly) is used inside. The 1.8T is only a computer chip away from 200 horsepower/200 ft-lbs of torque, but if the potential sludge issues and constant coil pack failures associated with the 1.8T have you wishing for a simple V6...that could be had with a manual trans too. This 2001 Audi A4 currently bidding for $1,525 is equipped with the V6, Quattro and a DIY gearbox. The 2.8 liter Audi V6 puts out 190 horsepower, and while this might be the heaviest of B5 clutch equipped A4 combinations available (aside from the wagon) it probably weighs less than a new A3. Where are the rings? 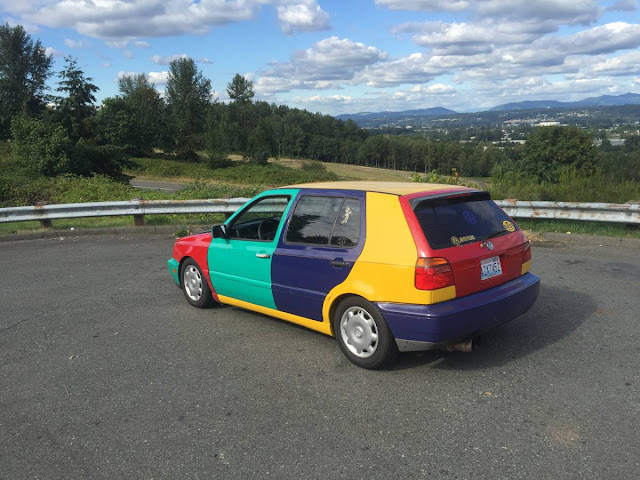 The front looks like when they use a car for a print ad and try and change the appearance. I enjoyed owing a B5 Audi. Very nicely designed. I did not enjoy paying my Audi mechanic my whole check every week. The 5-spd Quattro cars were wound out at highway speeds - 3krpm at 65mph gets really annoying. Redline limited 138mph top speed in 5th if that tells you anything (GPS confirmed, and it took almost the entire length of a runway to get there). The 160mph speedo LIES. Also, 200bhp in this car does not equal "quick". It certainly feels quicker, but you'll still get dusted by your neighbor's teenage kid's stock '98 Civic Si. And thus I am fairly happy with my new to me (now two-owner) 1995 9000 Aero 5-spd with 73k mi on the clock. Sure, it's not Quattro, but it's still fun. Two words: Quaife LSD. You don't need no stinkin' Quattro. IIRC installing a LSD into a B5 also involves using a part from the Porsche catalog - a Boxster rear diff cover? These cars tighten up very nicely if you replace all the 1000's of mounts and bushings under them. Mine, at 150 hp, never felt slow, even though I never for one second thought that it actually wasn't. One exciting feature on my 97 was that the brakes had a 1-2 second (or more) delay in the rain. I fixed it with later rotor backing plates and some slotted rotors. The aftermarket for them is truly immense, pretty much anything you want. But in the end if you take all of that plus the price of the car you could just get something that starts out much better to begin with. Agreed on the cars not feeling slow, even though they might have been. The front wheel drive versions with 5-speed and 1.8T (B5 Passat or A4) hit the scales right around 3000 lbs, which isn't a bad weight -- and with a Neuspeed chip, the B5 I owned for a few years felt decent. The semi-independent rear end could be tightened up with some aftermarket pieces and in the end it was a fun car for un-fun-wheel drive. I sold mine and picked up an E36 M3 2-door right around the time we had our first kid...the wife was not happy. You made a better move than I did, I went from the A4 1.8t Quattro to an XJ8 battleship. She was also not happy. I did get a v6 Passat later that I liked a lot. The FWD didn't really detract from it at all. That generation of Audi was attractive, nice enough to drive, and not overly complex, but a little short on rear knee room for a sedan. I used to say that if your back seat passengers had no legs you bought an Audi A4, and if they had no neck you bought a Ford Contour. The Audi had headroom but no legroom, the Ford had legroom but no headroom. A product of the era when Ford was apparently run by really short people. And the B6 A4 had neither headroom, nor legroom in the back so obviously Audi didn't quite learn their lesson.